Experience now the technique of carriage riding driven by small horses. 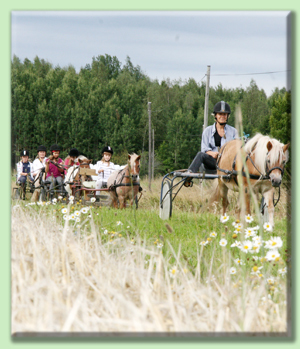 Horses in Sweden do have an interesting history and nowadays is horse riding very popular in Sweden. There are various kinds of horses and horse riding techniques. In the ancient time was the horse the most important ‘living working tool’ in the Swedish daily lifetime. The horse has its role in the forestry, mining and agriculture. The strongest horse for the toughest job was the “Nord Svensk Brukshäst”. The “Islandshäst” is the most manageable horse, can stand the Swedish climate and has its roots on Iceland. Experience now the technique of carriage riding driven by small horses. This is a great experience for children who haven’t ‘seen’ a horse before. The children will learn to settle up the equipments and to manage the horse and steer the own carriage. You will make a tour through the beautiful landscape under professional guidance of Marie Gerkhe. At the end of this adventure you will share your experiences around a grill and grilling some sausages Swedish style!